This article orginally appeared on Salon.com. How? In interviews, a half dozen of the best White House correspondents of the recent past have offered up some suggestions for the reporters who will be covering Bush's second term. And one place they can start is by reminding the public of a number of important, outstanding questions left unanswered about Bush's first term. Covering the White House has always been a challenge, but this administration has been particularly reluctant to answer questions. This president even seems to have an aversion to being in the same room as people who might disagree with him. Bush's news conference track record, while frankly not the most important example of these two tendencies, is one of the most overt -- and is the easiest for the press to do something about. The president is not averse to questions, per se. It's a matter of who's asking. During the campaign, Bush took questions almost daily -- from carefully screened and adoring supporters. Their questions tended to be real tough, like this one at an "Ask President Bush" event in Niceville, Fla.: "Mr. President, I was wondering if you were a Christian?" But according to figures compiled by Martha Joynt Kumar of Towson University, when it comes to solo news conferences, Bush has held only 16 during his first term -- a far cry from the 43 Bill Clinton had at this point in his first term, and the 84 by Bush's father. It seems unlikely that Bush, in his second term, will adopt John Kerry's pledge to hold one press conference a month if elected. In fact, it's entirely possible that Bush will try to hold even fewer than he did during his first term. It's not as if there was a voter backlash for avoiding the media's questions -- so why should he subject himself to more than he absolutely has to? There was a hint of this in Bush's obligatory post-election news conference on Nov. 4, when he only half-jokingly suggested that the "will of the people" now entitled him to establish more restrictive rules with the press corps. And you'll note that since then, he's only been seen in short, carefully controlled photo ops and joint sessions with other world leaders, who serve as unwitting foils. And for Bush, questions from the press are not so much inducements to deliberation as they are cues for carefully massaged sound bites that, often as not, the assembled reporters have already heard time and time again. Only very rarely does Bush actually engage a question and break new ground with his answer. And although it has come to the point that no one in the press corps really expects a direct answer anymore, that doesn't mean they should give up on trying to get one. Even more of a charade these days are the daily briefings held by White House press secretary Scott McClellan, whose robotic adherence to repeating the predetermined messages of the day -- no matter what questions come his way -- has driven some correspondents to despair. Only narcissists and cranks could possibly feel they are getting much out of asking a question at a McClellan press briefing. Not coincidentally, the cranks are increasingly sitting at the front of the briefing room and getting called upon, in part because some big media organizations don't even bother to fill their assigned chairs anymore. What's the point? It's true that news conferences, even of the presidential variety, have never been the most important tool for covering the White House. Deflecting tough questions and instead delivering a pre-planned message is a long presidential tradition. Like those before him, Bush goes in heavily briefed by his staff on the likely questions -- most of which are predictable -- and girded with related, but not necessarily responsive, responses. He picks the questioners, he doesn't brook interruptions, he sticks to his message. Lou Cannon covered the Reagan White House for the Washington Post. "News conferences have always been a forum for the president to say what he wants to say, not for us to get the information that we want to get," Cannon said in an interview. "Occasionally some nugget will come out, but the news conference is really controlled by the president." But Sam Donaldson, who covered the Jimmy Carter and Reagan White Houses for ABC News, said Bush abuses the format more than any of his predecessors. "I think they have it tougher than I ever had it," he says of the modern press corps. "This president has memorized what he wants to say, which he makes fit almost any variation." For instance, Donaldson says, "If the word 'Iraq' comes up, you are going to hear what you've heard 14 or 15 times before. He's not going to really engage in answering the question." White House news bombshells have pretty much always come from aggressive reporting and leaks, rather than from the president's own mouth. And when presidents are revealing, it's typically in one-on-one interviews, especially longer ones with interlocutors who are prepared, nimble and brave. Nevertheless, as Hearst columnist and legendary White House press corps veteran Helen Thomas puts it: "The presidential news conference is the only forum in our society in which the president can be questioned. If he doesn't answer questions, there's no accountability. He can rule by edict -- which he is very much doing these days… We speak for the American people. We have a direct contact with the president of the United States and they don't." So what's a press corps to do? For one, White House reporters should become more assertive in demanding that the president make himself available. They should raise the issue every day in the daily briefing with McClellan, instead of only once every few weeks. In fact, they should also bring it up every time they get in earshot of the president. ("Mr. President, why won't you meet with us once a month?") Correspondents are sometimes loath to appear too activist or hectoring. But there is nothing inappropriate about the press demanding accountability from the president of the United States. And they should ask better questions. Some folks who should know -- because they've successfully asked tough questions of previous presidents -- say there are several ways the current White House press corps could get more value out of even infrequent press conferences. Their advice to the current crew, in a nutshell: When your turn comes to ask a question at a presidential press conference, don't worry so much about how smart you will sound asking it, and resist your urge to ask more than one thing at a time. Instead, try harder to ask one question that will actually get an answer. The question should be simple and direct enough so that everyone, including the president, understands precisely what is being asked -- and so that if the president doesn't answer it, it's clear to everyone that he has chosen to avoid it. Consider one modest example of what not to do, from Bush's Nov. 4 news conference. Here's what the first reporter Bush called on did with his opportunity to elicit information from the president. "Mr. President -- thank you. As you look at your second term, how much is the war in Iraq going to cost? Do you intend to send more troops, or bring troops home? And in the Middle East, more broadly, do you agree with Tony Blair that revitalizing the Middle East peace process is the single most pressing political issue facing the world?" 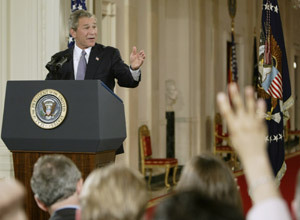 Even Bush was taken aback at being asked all those questions at the same time. "Now that I've got the will of the people at my back, I'm going to start enforcing the one-question rule," he said. "That was three questions." Possibly encouraged by the corps' sycophantic guffaws, Bush -- after a smooth-sounding response that didn't directly answer any of the three questions, by the way -- announced a new rule: "No follow-ups today." Putting the appropriateness of Bush's bullying -- and the press corps' accommodation -- aside, the irony is that the one-question rule would actually serve the correspondents well. The no follow-up rule, however, could be fatal. Talking to Cannon, Thomas and others, the same critique emerges over and over again: Of course the president doesn't want to answer tough questions -- but reporters are making it easier on him than they should by asking questions that are entirely too long-winded. Anything lengthy or multipart makes it easier for the president to deflect, distract and filibuster. Plus it gives him more time to collect himself for his response. "One of the things that happens with long questions is they chew up a lot of time. Presidents love long questions," Cannon said. "The best questions are those that are asked simply and asked with the least windup." And of course long, amorphous questions effortlessly lead to longer, more amorphous answers. So ideally, questions should have concrete answers. John Herbers, who covered the White House in the 1970s for the New York Times, thinks "When did you learn about it?" is often a good thing to ask. Shorter questions that require only short answers also mean there's time for more questions. If the president deflects a really good and important question, the reporter should follow up. "You should always have a follow-up question in mind," Cannon says. "Instead, they ask six questions in one and then they say they have a follow" -- but it's actually a seventh, unrelated question. If need be, other reporters should follow up, rather than sticking to their scripts. "We should listen, and not be so ego-attached to our own questions," said Thomas. And reporters shouldn't be afraid to look a little disrespectful if that's what it takes to get an answer. "This is not a social engagement, this is a business transaction. The president knows it's business, believe me," said Donaldson. Being aggressive carries a slight risk: "It makes your bosses nervous, when they think of all their relationships, including the state dinners they want to be invited to," he said. "But I never had to worry that my boss would not back me, as long as I was doing something legitimate." Even the two- to four-question Oval Office photo ops that Bush has at times held fairly frequently could be much more useful if the questions were stronger, said Ann Compton, who has been covering the White House for ABC News for most of the past 30 years. "The questions they ask in the Oval Office photo ops are weak and predictable -- going for just a quick headline," she said. Reporters should stop asking superficial "What's your reaction?" questions, and instead ask "What are you going to do?" or "How can you explain?" questions, she said. "One of our greatest failings is in not asking questions that are deep enough." Shouting out questions when the president is passing by, the old Donaldson standby, doesn't work well with Bush. He tends to just glare. Who was responsible for the faulty intelligence about Iraq's WMD, and why haven't they been held accountable? What has changed about the administration that would give the public the certainty that if we go to war again, it won't be based on faulty intelligence? When did Bush become aware of the memos written by White House and Justice Department lawyers sanctioning torture and the circumvention of the Geneva Conventions in certain circumstances? And did he support or reject them? Does Bush know who leaked Valerie Plame's identity as a CIA operative? Who did it? If current workers are allowed to invest some of their Social Security taxes, that amount will have to be made up in some other way, unless the government reduces payments to current or future retirees. So what's it going to be? How can the government reduce the deficit if it won't increase taxes and it doesn't reduce spending? If the tax code overhaul is to be revenue neutral, and one goal is to reduce the tax rate on savings, what taxes go up? If preemptive war against Iraq was justified, what other nations might merit preemptive action? At this point, the best thing reporters can do is ask questions so simple and direct that Bush's almost inevitable evasion is obvious to everyone. And then they should repeatedly remind their readers and viewers that the questions remain unanswered. Maybe Bush can be prodded and shamed into meeting with the press more often. And maybe White House reporters -- who are, after all, among the best of their profession -- can craft the occasional question that actually prompts the president to reflect upon a decision, recall an event or reaction, give some insight into his judgment, or even spill some beans. But more realistically, the best outcome we can hope for is that better questions themselves will help the media and the public focus on the vital issues of the day -- so that the president's minimally valuable responses to them can at least appear in well-researched, consequential news reports full of context and facts. I was abroad and out of touch with media during the initial stages of Katrina. When I finally checked into a hotel with TV access, I was shocked to see the antagonistic, agressive questioning of administration officials that characterized every interview and aspect of the reporting, at least on CNN. It seemed more than a bit overboard, but as events have shown, it probably wasn't. It also surprised me in the following days that the press was willing to finally highlight the Bush administration's penchant for always being "on message". I had always wondered why the media had ignored this aspect of the administration communications strategy. This time around, however, the media picked up on the ubiquitous, repreated use of "the blame game" to deflect hard questioning. It will be interesting to see if Katrina and the policy defeats of the second term are sufficient to give the press the backbone to do a better job of 'oversight' for this administration. At least it's a start. Bush's evasive maneuvers continue, as Dana Milbank points out in The Washington Post.